Click here for audio of Episode 922. Today, a story of darkness before the dawn. The University of Houston's College of Engineering presents this series about the machines that make our civilization run, and the people whose ingenuity created them. 1764 was a good year for 28-year-old James Watt. Five years later, his life began a long slide into grief and frustration. 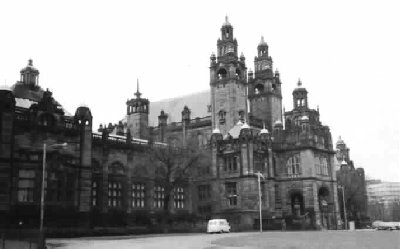 Watt was an instrument-maker at the University of Glasgow. The year before, he'd been asked to fix the Newcomen steam engine model that demonstrated steam power to students in the natural philosophy class. It hardly moved under its own power. Could Watt identify the problem and eliminate it? Watt struggled with the waste of steam each time it was let into the cylinder. Half of it condensed on the walls, cooled by the condensation process that'd occurred in the previous stroke. In 1764 Watt solved the steam engine problem. He saw that if he separated condensation from the cylinder, the cylinder would stay hot and the condenser cold. No more wasted steam! He also married his cousin, Margaret Miller, that summer. It was a happy marriage. Everything was coming up roses for Watt. But now he had to make a working model of his new engine, and that was another matter. Watt was soon going broke, so he sold two thirds of his patent to an inventor and speculator named John Roebuck. Roebuck's iron works was in trouble because its coal mines were flooding. He hoped to use Watt's engine to pump them dry. The engine still had too many bugs to do the job. Then Roebuck made some bad business gambles. By 1769 he, too, faced bankruptcy. He had to sell off his holdings to get out of debt, and no one would put up a farthing for his share of Watt's patent. Matthew Boulton, an industrialist from Birmingham, finally saw what others didn't. He gave Roebuck £1200 for his share of the patent. He bailed them both out, and Watt kept struggling. For the next four years Watt wrestled with his engine. His wife tried to buoy him. "If it will not do, something else will," she wrote. "Never despair." Meanwhile, two of their children died as infants. Finally, as if to make trouble complete, Margaret died in 1773. The last threads of Watt's life came undone. Watt tried to cope with it all. Finally he wrote, "I know grief has its period; but I have much to suffer ... "
Yet there really is a season for everything -- "a time to mourn and a time to dance." By 1776 the engine was running. Watt moved to Birmingham to work with Boulton. And he remarried, happily, once more. By the time he died 43 years later, he'd changed history and was the most honored engineer who had ever lived. That year, 1776, Boulton could cheerfully tell Johnson's biographer, Boswell, "I sell here, Sir, what all the world desires to have -- POWER." Watt had emerged from his ashes to reshape the world. It had finally become his time to dance. Arago, F., Eloge Historique de James Watt (Tr. from the French, with additional notes and an appendix by James Patrick Muirhead). London: J. Murray, 1839. The latter two rare books were provided by Special Collections, UH Library. 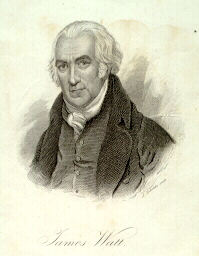 J.P. Muirhead, whose name appears in two of the sources above, was James Watt's first cousin twice removed. He and François Arago were the primary biographers of James Watt. in that wherein he laboureth? which God hath given to the sons of men to be exercised in it.